Guardians of the Galaxy auteur James Gunn is busy writing the third installment in his hit Marvel series, but he’s running into a bit of a roadblock. He’s thinking about retconning an established part of his universe for the next film. We’re pretty sure we know what he wants to change—and while it wouldn’t destroy the Marvel Cinematic Universe, it does raise the question of what it means for the MCU to break its own canon. In order to figure out what he could mean, I went back and looked at all the information shown in that part of the film. Most of the information is pretty innocuous, like height, weight, and criminal records. Peter Quill and Gamora had a fair amount of their background explored in the films, like Gamora being the last known survivor of her species. There are some unique bits of information for Drax, Groot, and Rocket. But some wouldn’t require a retcon—like Drax’s rap sheet, which is shown in the trailer but not the film. The only new piece of information shared there is that his species is “unknown” to Nova Corps, and given that we know his planet was targeted by Thanos, that’s not really a big deal. Then, there are also things that are too vague to need a retcon, like Groot’s mysterious friend Tibias Lark, who has no exact comics equivalent that means something very specific to fans that Gunn would have to change. Therefore, by process of elimination, the secret plot point Gunn is most likely thinking about changing is Lylla, listed as a known associate of Rocket’s. Lady Lylla (from Marvel’s 616 Universe) is a sentient otter from Halfworld, the same planet that Rocket is from. She’s the heiress to the planet’s largest toymaking empire, Mayhem Mekaniks, and was continually courted and threatened by competitors wanting to take over her family’s company. However, Rocket is and will always be her soulmate, so she refused to marry anyone else. She sided with Rocket during the planet’s so-called Toy War, and later left Halfworld with him in search of more adventures. You’ll have to wait and see on Lylla. But I will say I think a raccoon being sexually attracted to an otter is similar to a human being sexually attracted to a possum. 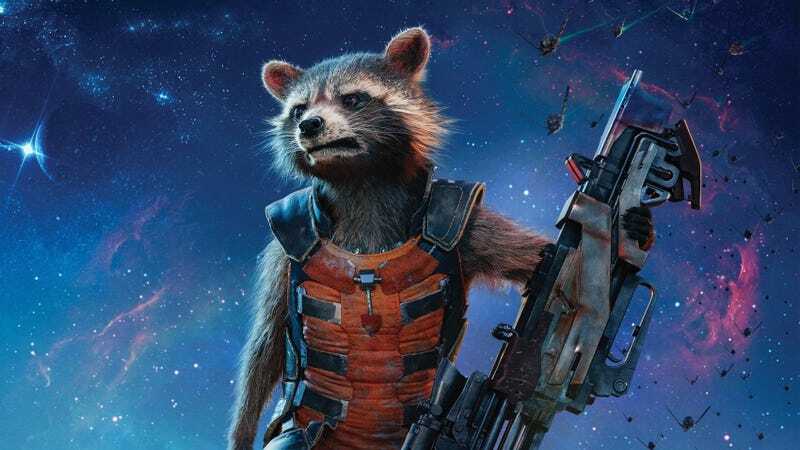 I think it’s very important that Rocket is the only thing like him, which is the source of his sadness and loneliness. An otter girlfriend could get really cartoony really. Weird “human-possum love” comparison aside, it makes sense that Gunn wouldn’t have wanted Lylla in the second film, since part of it centered around Rocket bonding with Yondu (and learning how to trust others) and she would’ve complicated that dynamic. So that could mean that the matured Rocket is in a good place to meet and fall in love with Lylla, making their first meeting in the third movie. Or Gunn could want to do the Toy War storyline, again complicating the whole “known associates” bit. Even though the detail is small, one word on one rap sheet, it would be kind of a big deal as it might just be the first time the MCU has knowingly broken its own story canon. It’s not the first official canon break— that honor goes to replacing Terrence Howard with Don Cheadle for the role of James Rhodes in Iron Man 2, and then Edward Norton with Mark Ruffalo as the Hulk for The Avengers. But in terms of the story itself, this would be a change from the norm. I did something in the first movie of Guardians where it was in the background but it was distinctly there, and people know that it’s there. And I’m like goddammit. Because I have a really good storytelling reason for breaking the canon, and I stayed up last night figuring out if I’m gonna do it or not. I still don’t know. It’s good that Gunn is thinking about how his decision would impact the MCU and that he knows fans obsessively track these small details. But at the end of the day, I don’t think retconning something like Lylla’s introduction would be that big a deal—especially since he’s being honest with fans about why he’s doing it and the risk it poses to the established timeline. If the choice is either break the canon or not have Lylla, I think having Lylla is worth it. I’d love to see what she’d bring to the next Guardians film and to Rocket’s character. One tiny crack in the MCU’s glossy veneer is a small price to pay for that. Clarification: There is some confusion about the first recasting in the MCU (I even confused myself!). It was the recasting of James Rhodes, as Iron Man 2 (2010) with Don Cheadle came out before The Avengers (2012) with Mark Ruffalo.